Red/Blue An aggressive POK�MON that is quick to attack. it senses any� thing, it attacks immediately. Emerald Its horn is harder than a diamond. If it senses a hostile presence, all the barbs on its back bristle up at once, and it challenges the foe with all its might. Leaf Green An aggressive POK�MON that is quick to attack. The horn on its head secretes a powerful venom. Diamond/Pearl It has a violent disposition and stabs foes with its horn, which oozes poison upon impact. 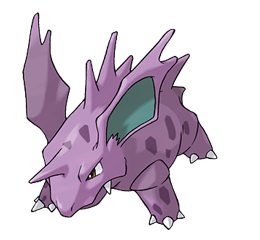 Platinum It has a violent disposition and stabs foes with its horn, which oozes poison upon impact. Heart Gold It raises its big ears to check its surroundings. If it senses anything, it attacks immediately. Soul Silver Quick to anger, it stabs enemies with its horn to inject a powerful poison when it becomes agitated. Black It has a violent disposition and stabs foes with its horn, which oozes poison upon impact. White It has a violent disposition and stabs foes with its horn, which oozes poison upon impact.